Members of a visiting party from the Blackpool Civic Trust were fascinated and highly impressed when they toured the lodge rooms and Masonic Museum at Blackpool Masonic Hall. The upper lodge room at the Masonic Hall. Organised by Past Chairman of Blackpool Group Peter Bentham, the visit provided a very informative tour of the building by Peter, David Cook and Alan Whitehouse, whilst museum curator Martyn Jones was on hand to enlighten the guests about the eclectic collection of historic Masonic regalia, jewels, documents and artefacts on show in the museum. Joining the party were North Fylde Freemason Glen Jackson and entered apprentice Tom Cunningham who had travelled from Newton-le-Willows to expand his knowledge of Masonic history and view the facilities at Blackpool. The opulence of the upper lodge room was the first thing that awakened the visitors’ interests. It is considered by many to be one of the most impressive lodge rooms in the Province of West Lancashire and some of its furnishings date back to the early 19th century. The Wedgewood blue Jasperware style of decoration provides a distinctive backcloth for Masonic ceremonies and immediately captured the imagination of the visitors. The experienced Masons who were conducting the party on the tour were perfect guides with whom to view the lodge room. Their enthusiasm and passion for the room was contagious and inspiring and their in-depth knowledge left no question unanswered. 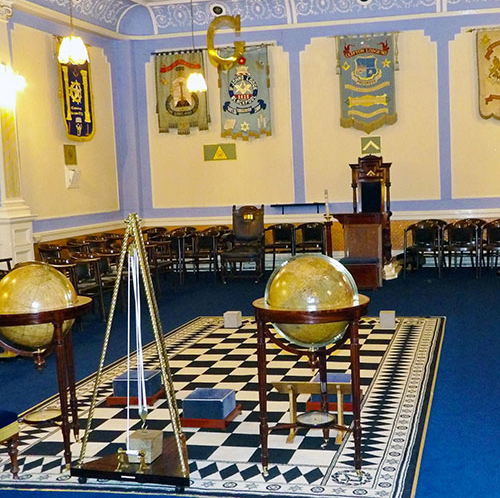 Having toured both lodge rooms in the building, the Masonic Museum assembled in the lower dining suite was the final calling point for the visitors. Officially opened by the Provincial Grand Master Tony Harrison on 24 June 2017 as part of the Blackpool Group’s Tercentenary celebrations, the intriguing collection contains some very early Masonic documents, pre-United Grand Lodge regalia and a large collection of pre-WWII Masonic jewels. A small sample of the exhibits in the Masonic museum. Proving to be of particular interest to the visitors from the Civic Trust were rare aprons dating back to 1800, a hand-made apron from a WWI prisoner of war camp and artefacts from the quasi-Masonic Order of Free Gardeners. Browsing at their leisure, the party scrutinised each exhibit and were intrigued by the history and evolution of Freemasonry. The visit proved a major success for the visiting party. Few had any knowledge of Freemasonry and its colourful and intriguing history but the party left with the view that Blackpool Masonic Hall should be considered a major attraction during the Heritage Open Days that will take place in September. The party of visitors from the Blackpool Civic Trust.